As we inch closer to spring, we begin to think about what we will need to be done for lawn care once the snow and cold finally goes away. We know about things like grass side and fertilizer. Don’t forget about topdressing. Simply put, topdressing a lawn means putting a thin layer of material over the lawn. It can be made up of compost or another type of soil amendment. The material, which should not be more than a half-inch thick, is usually spread over the turf. It showed be applied with a shovel, in a throwing motion. The material can be allowed to settle on its own. In addition to compost, topdressing material can also be things like mulch, peat, loam or a combination. There are several benefits to using topdressing. One benefit is improving the existing soil. Topdressing can improve drainage in clay soils and improve moisture in sandy soils. Topdressing should benefit a yard’s soil by adding nutrients and allowing the grass to absorb those nutrients. This also allows the lawn a better chance to fight off disease. It does this by boosting healthy organisms in the soil. Good topdressing will also improve soil biology by adding organic matter and beneficial micro-organisms. Topdressing can also help fight thatch in yards. Thatch is a layer of dead stems, roots and other material that develops between healthy vegetation and the soil. Excess thatch can cause problems for a lawn. Taking a lawn rake to areas of excess thatch, then applying topdressing can help re-energizes areas of your lawn. Topdressing can also be used as a healthy “filling”. 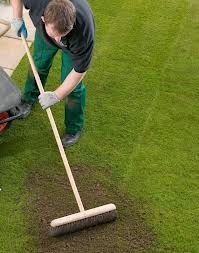 It can fill in depressions and sink holes in lawns and level out any imperfections. An annual spread of topdressing, along with regular mowing and sprinkler system use, can help keep your lawn green for years to come.